OPEN will be holding a public meeting at 7pm Wednesday 1 March at St Marks Church Hall, Colvestone Crescent, E8. 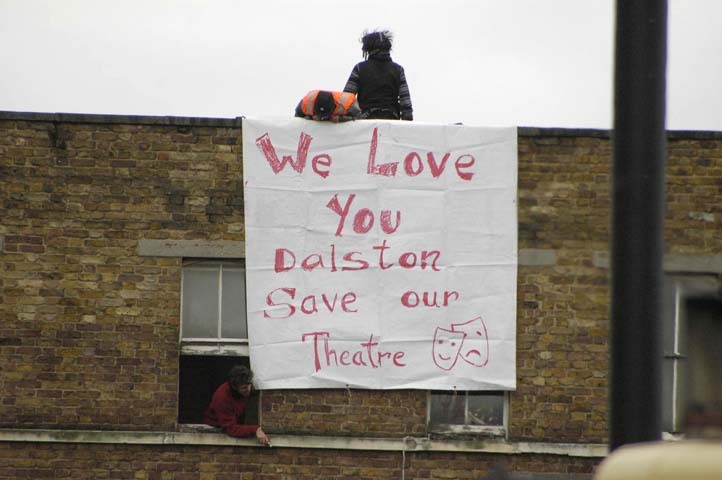 We will be giving an update on OPEN's campaign in Dalston, the occupation of the Dalston Theatre and buildings, and the continuing demolition threat. We will also discuss the Transport for London development plans for the Dalston Junction site. The Hackney Council planning meeting to decide on this application has now been set for Thursday 30 March. A High Court judge yesterday found in favour of OPEN in its claim that Hackney Council, in late 2005, made an unlawful attempt to demolish the historic buildings at 4-14 Dalston Lane, without public consultation. OPEN issued proceedings on 13 December 2005, challenging the Council’s decision to proceed with demolition of the buildings without making a full planning application. OPEN is committed to seeing some or all of the heritage buildings restored for new uses as part of regeneration of the wider area. OPEN argued that a full planning application, involving public consultation and a decision by the elected Members of Hackney Council, was required. A High Court injunction was subsequently issued preventing any demolition work until yesterday’s judicial review. The injunction has protected the site from December 2005 until now. Finding in favour of OPEN’s claims yesterday, Mr Justice Lloyd Jones stated in his judgment that the Council had created the impression that it had taken a decision to demolish the buildings as soon as prior approval was granted by the Planning Department and that full planning permission was not required. The Judge found that OPEN was justified in issuing the proceedings for an injunction and judicial review. He ordered the Council to now pay OPEN’s legal costs. Since the issue of the High Court proceedings on 13 December 2005, and following representations made by OPEN to the Planning Department, the Council have accepted the need to make a full planning application for demolition. After a 21 days period in which the public could lodge objections, the Council’s application for total demolition came before a Planning Sub-Committee on 6 February 2006. Despite the overwhelming number of objections to the proposals the Planning Sub-Committee voted to demolish the buildings in their entirety. The Sub-Committee imposed a condition that, prior to demolition, there must first be a survey to record historical structural and architectural detail of the buildings and expressed hope that the more notable elements could be relocated in the redevelopment of the site or elsewhere. 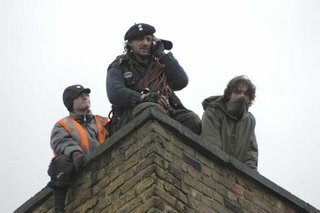 Evidence has also come to light that, sometime between 18 October 2005 when the Council secured the buildings against squatters and 16 December when a planning officer inspected them, the Victorian houses at 4-6 Dalston Lane have been deliberately damaged and made uninhabitable by the removal of the staircases. 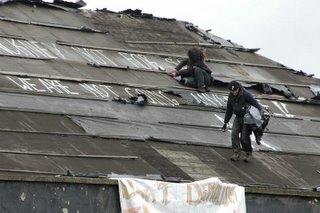 Since Sunday 19 February the buildings have been occupied by people concerned to prevent their demolition. OPEN is now considering the legality of the Council’s Planning Sub-Committee’s resolution on 6 February, and any decision by the Council to now act on the planning permission granted to demolish the buildings. 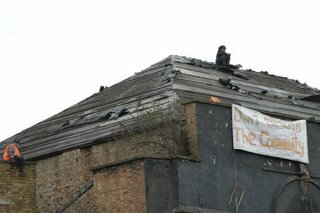 The Victorian and Georgian buildings at 4-14 Dalston Lane, E8, are now occupied by people who are concerned at the threat of demolition. OPEN understands that council officers are currently seeking to effect re-entry to the buildings. The historic site, which consists of the Victorian Dalston Theatre and a pair of Georgian townhouses, was condemned to total demolition by a Council Planning Sub-Committee on 6 February 2006. The Council Committee’s decision to vote for total demolition disregarded many objections from the local community, heritage agencies and community groups as well as OPEN, which is committed to seeing the buildings re-used as part of a wider regeneration for the area. On Monday night, Hackney Council approved proposals for the total demolition of the Victorian and Georgian heritage buildings at 4-14 Dalston Lane. 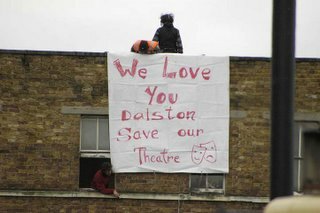 The Council Planning Sub-Committee ignored the objections raised by local market traders, businesses, arts groups and residents of Dalston, and voted to level the site, while simultaneously acknowledging that Councillors have not been presented with any plans for what will replace the historic buildings. The decision was greeted by loud protest from the 60 members of the public who had succeeded in attending the meeting, despite the council’s confused attempts earlier in the evening to limit public entry to just half the public gallery’s usual capacity. 100 members of OPEN had peacefully protested outside the Town Hall before the meeting started. OPEN’s chairman, Bill Parry-Davies, reacted to the council’s decision with dismay. 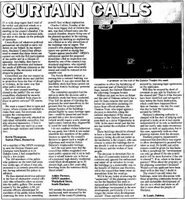 "This wastrel council has a reputation as philistines with no regard for Dalston’s history and culture and being only concerned with selling our property to finance their bankrupt ideas for the Town Hall Square. They didn’t take the chance to change that reputation tonight." He also expressed disbelief that there had been no leeway in the meeting for saving even those elements of the site that English Heritage and others had praised. "The application to demolish the whole site in its entirety, precluded any consideration of retaining the beautiful Georgian and Victorian frontages" he said. "It’s a disgrace that there was no opportunity for council members to vote on retaining any aspects of the site." "[We object to the proposals on the grounds that] we would need to be satisfied that the building is surplus to regeneration, cultural and community requirements before we could support an opportunity for demolition. We believe that the 1886 entrance is the earliest surviving circus entrance in the country." "This group of buildings… is of great interest, encapsulating the development of the area in one small group… [they] are eminently capable of economically viable reuse; their potential is obvious and there is no need whatsoever to tear them down. 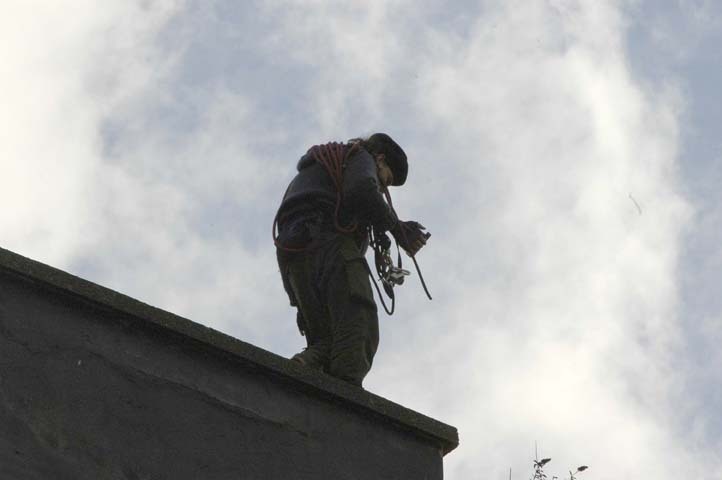 The alternatives to the demolition of these buildings have not been adequately considered." "Nos.4-14 [Dalston Lane] comprise the most unusual, important and picturesque buildings in the street… one of the most interesting groups of historic buildings in this part of North London. Their demolition would be an unforgiveable oversight by Hackney Council… our built heritage is irreplaceable." Last night’s decision disregarded all of these objections as well as the huge number of other objections which were sent to the Council by individuals. Hackney’s Property Services were unable to offer any explanation to Councillors why it was essential for them to approve demolition of Dalston’s heritage now, before there is even a planning application, let alone agreement, as to what will replace them. OPEN is also concerned as to the Planning Department’s position in advising the Councillors on the demolition application. 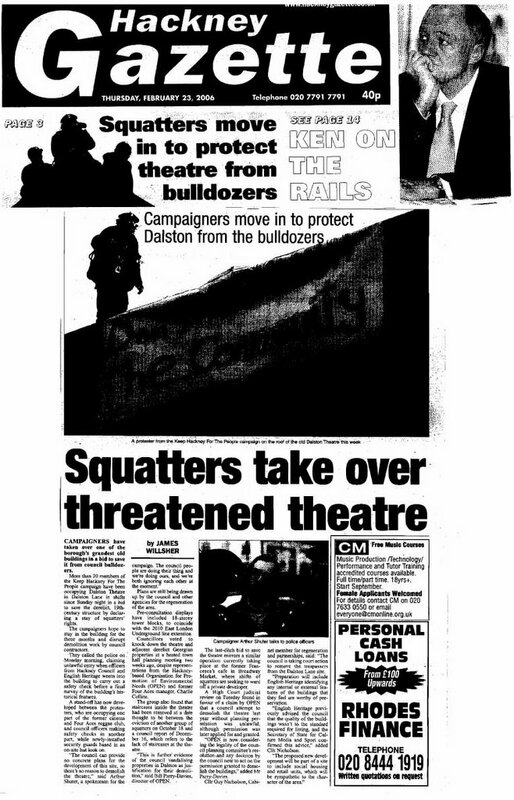 In early 2005, months before the current public consultation process on the future of the site had been started, the Council’s planners sat with Transport for London (TfL) and the London Development Agency on the GLA steering committee which decided the Dalston master-plan. This plan did not envisage any retention of the heritage buildings. The heritage buildings at 4-14 Dalston Lane are safeguarded by a high court injunction for just two more weeks. Following Monday night’s decision the bulldozers can start work at 4pm, Tuesday, 21st February. OPEN’s campaign to save these buildings continues. 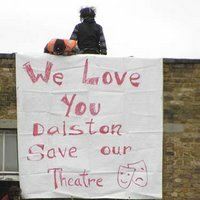 Hackney Council is meeting on Monday 6 February at 6.30pm to decide whether to demolish the Dalston Theatre/Four Aces and adjoining Georgian and Victorian buildings. Hackney Council's Planning Department have recommended that the buildings be demolished. They wrote their report on 26 January, days before the end of the 'public consultation' period on 30 January. The Committee will not be shown any of the several hundred letters of objection that have been sent to Hackney Council. We will be gathering at 6pm in front of Hackney Town Hall on Mare Street. We are expecting ITV London Tonight to film us live and need as many people as possible to gather at 6pm to show the strength of feeling locally. This is your last chance to show Hackney Council that you do not want these heritage buildings destroyed to make way for 18 storey tower-blocks. The Planning meeting will then start at 6.30pm in the Council Chamber on the first floor of Hackney Town Hall and up to 50 people can attend. A maximum of 5 minutes is allowed for all objectors to present the case against demolition. We have registered for representatives from OPEN to speak at the meeting - 5 minutes to save 180 years of history! Hope to see you at the Town Hall! "On Dalston Lane time itself seems to lie around in broken fragments..."
In a renewed bid to 'regenerate' Dalston plans were last year unveiled by the London Development Agency for the area just south of Dalston Junction. The development, as part of the Dalston Area Action Plan, will include housing, retail units and a new library. The development is tied in with the opening of East London Line there in 2010 and the London Olympics in 2012. "We have been watching a continuing process of the municipal vandalism of our local heritage and economy and the disregard of our community's views" says OPEN spokesman Bill Parry-Davies "This group of buildings, like many others at risk nationally, uniquely reflects local architectural, cultural and social history and lends great character to the area." This follows on from what many people consider the deliberate running down (not to mention mysterious fires) of late Georgian terraces at 48-76 Dalston Lane and their subsequent cut-price sale to an off shore company. A public meeting last year was told that Nelson Bakewell sold an entire parade of shops on Dalston Lane as a job-lot for almost half their total combined asking price to an overseas developer that already owns 10 properties in Broadway Market. Public consultations regarding the proposed development took place last summer. Having attended one at CLR James library I came away none the wiser having failed to penetrate the labyrinth of jargon and officialese on display. 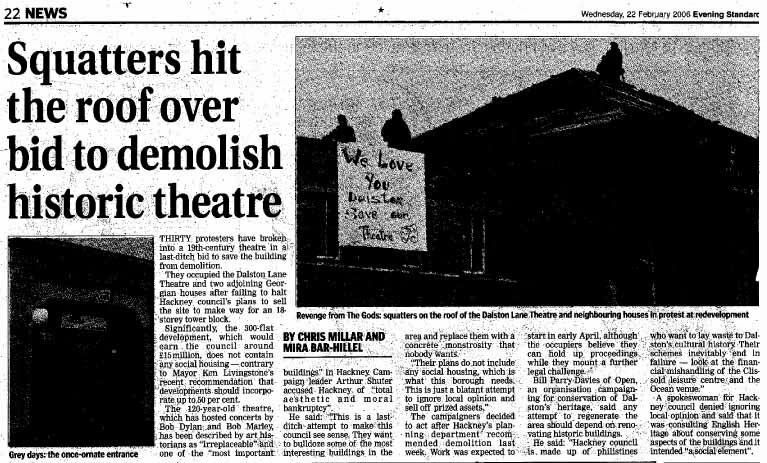 And nowhere was there any mention of the demolition of the Theatre and neighbouring buildings. Should there be a rush for development many are concerned that (much as in Broadway Market ) the area's rich mix of nationalities, classes and styles will be replaced by a another middle class ghetto as 'gentrification' starts to take effect. It's estimated that 50% of the new housing will be unaffordable for local people and a further 25% in the 'intermediate' price bracket. And will affordable rents for small local retailers be maintained or are they to be forced out as is happening in, yes, Broadway Market, and many other towns and cities? On 20 December a High Court Judge ordered Hackney Council not to take any steps to demolish 4-14 Dalston Lane until a full hearing later on this year. 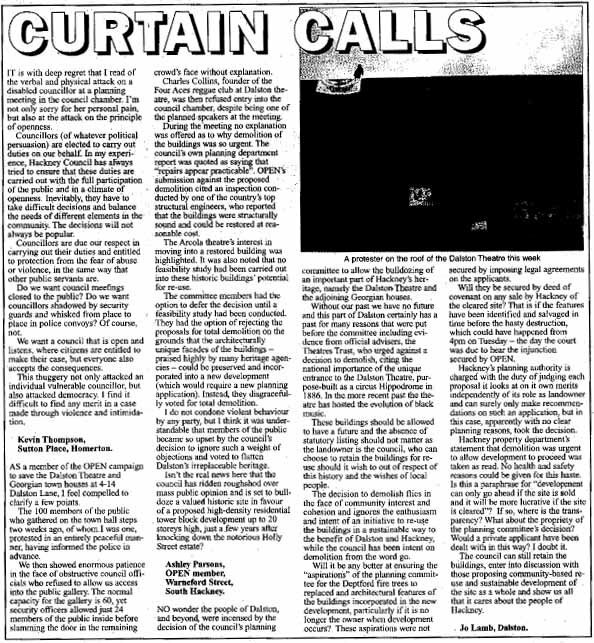 In the meantime, there are many people in the community who are calling for a greater transparency from our representatives at Hackney Council and they're asking who really stands to benefit from this development? Just what is "best value"? Best value for who? 1886: Built as a circus: the National Hippodrome, remodelled in 1898 as a variety theatre seating just over 3,000 people. 1967: the entrance buildings on Dalston Lane become 'The Club Four Aces' host to internationally renowned black musicians. 1970s: Home to Count Shelly and other reggae Sound Systems. 1990s: merged with a club in the main auditorium to become the legendary drum and bass & Acid House club, The Labyrinth.